Welcome! 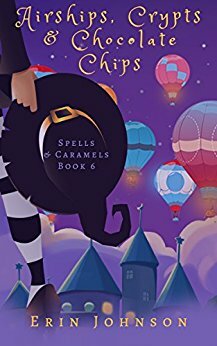 Today I’m hosting a spot on the Great Escapes Virtual Book Tour for Airships, Crypts, & Chocolate Chips, the sixth book in the Spells & Caramels series by Erin Johnson. Erin has done it again and brought us a fantastic book! 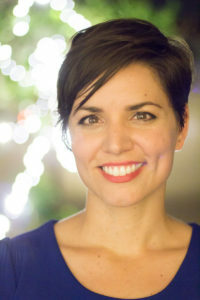 Erin Johnson has done it again! She’s brought us an absolutely amazing new story in the Spells & Caramels series! This one did not garner 5 stars from me though like the last two have. The sole reason it’s a 4.5 instead of a 5 is that I feel as though the book was a little too suspenseful. Cozy mysteries don’t usually have the suspense that Ms. Johnson put in this book. It even ended on a cliff-hanger. I felt as though that kind of detracted from the story line. In fact, I’m going to have to read it a second time because I feel like there are nuances I missed because I was so into the action happening. Outside of that fact, it’s a fantastic book. I adore the characters in this series and this book didn’t disappoint. The characters were as quirky and loveable as they usually are. Hank even goes above and beyond to prove his love to Imogen. Horace even becomes more loveable in this installment. I’m excitedly awaiting the seventh installment which I hope will be out soon since this one ended on a cliff-hanger! I do recommend that if you want to read the series, that you start with the first book in the series, Seashells, Spells, & Caramels. You’ll understand the interpersonal relationships a lot more if you start with the first book. Read them and enjoy them – it’s a great series! I do love this series. Lots of fun action packed into this one! Nice review Valerie. I am looking forward to starting this series. It has gotten so many great reviews.